When CORAL was initially developed by Robin Malott and Ben Heet at Notre Dame, the goal was relatively simple -- to develop an open source electronic resource management system (ERM) that reflects a librarian’s work. At the time, ERMs were large and unwieldy, and librarians found the lack of centralization and librarian-focus unattractive, to say the least. In 2011, Maria Collins and Jill E. Grogg described the “harried librarians” of the time who were “juggling byzantine email folder structures” and how earlier ERMs had failed to standardize and streamline any of their operations. Despite an obvious need for a focus on centralized e-resources processes, these ERMs functioned “less like a silver bullet and more like a round of buckshot.” The Notre Dame development team sought to alleviate these frustrations with the first version of CORAL, and the CORAL project has continued to meet the on-the-ground needs of library staff. With the July release of CORAL 3.0, the project includes new ways to streamline more library workflows and provide new interoperability. This new version of CORAL features a huge variety of new features, including a new tool for tracking multiple orders of the same resource record. 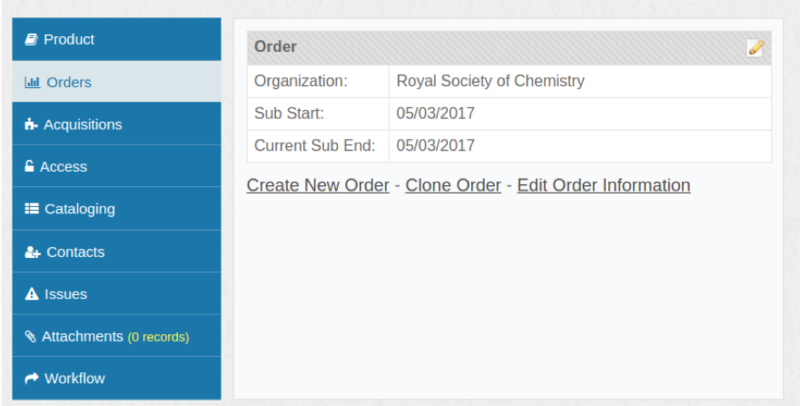 Library staff are now able to see recurring order information in the same window for easy comparison using the “Create New Order” and “Clone Order” options. The 3.0 release also includes the and the much EBSCO and Koha integrations that CORAL users have presented at many conferences. The manual import tool has also been updated to include a preview window (for checking import mappings) and an activity window for tracking the status of an import. Additionally, a new resource statistics and yearly cost dashboard has been added which will allow CORAL users to see resource activity at a glance. These enhancements, plus many bug fixes and updates to several language translations, make the 3.0 version more interoperable than ever before. With these improved functions and new possibilities for interoperability, many libraries are expanding their usage of CORAL. “We now utilize most modules in some manner to manage our e-resources,” says Rebecca Tatterson, Electronic Resources Librarian at Eastern Carolina University, in describing the library’s recent update to 3.0. ECU quickly figured out how to use 3.0 to map CORAL to the A-Z databases list that users navigate on the library’s website. “The integration allows for a seamless process to manage resources in a central location, the CORAL ERM, and also simplifies maintenance of Libguides by keeping subscribed resource collections up to date.” As librarians install and update to CORAL 3.0, they continue to find new ways that the integrations and bug fixes can help automate e-resources processes. Updating or installing CORAL still implements the Unified Installer, and system administrators can find system requirements and download the 3.0 release on Github. The website, documentation and demo site have been updated as well. Feedback is highly encouraged! Users can submit feedback to feedback@coral-erm.org or the user group on the CORAL Discussion list. The Steering Committee will look toward lengthening the roadmap of CORAL and addressing pressing issues with the system, and user feedback is vital to that process.